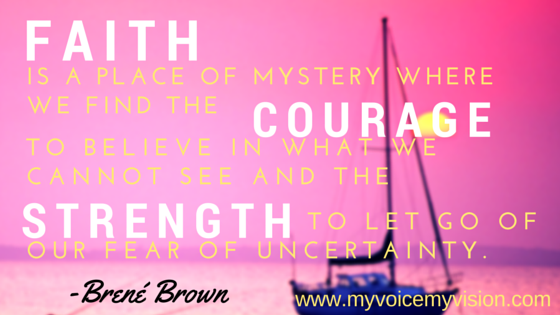 Me and Brené, Cultivating Intuition and Trusting Faith – My Voice. My Vision. I could not have planned the timing of this guidepost any better if I had tried. Even if I had tried it would have gotten thrown off by, yet another, adjournment request from opposing counsel. Two weeks ago my faith was waning and my intuition was being second guessed at every turn. To fill you in, five weeks ago I filed a motion with the family court to enforce my rights as a litigant, once again. This time for child support that has gone unpaid for far too long and to ensure that my son be kept in school his final two weeks of the school year. Aidan’s father decided that instead of waiting until summer vacation he should plan a Disney vacation two weeks before and pull Aidan from the last two weeks of school. Without so much as consulting me. I let a lot of things fly but this was NOT going to happen, especially since he took me to court to Order me to put Aidan in pre-school a year ago. We have been before our family court judge seven times in the last two and a half years. Every time we are in courtroom 19, I wind up losing time with my son. When we started custody litigation it was a 95/5 split and there wasn’t a day that I didn’t get to hold my little boy. I only had to sleep one night without him under the same roof. It killed me, even knowing he’d return the following morning. We are now at a 70/30 residential split, with Aidan spending 12 nights a month at his father’s house. It is torture. This would not be great even if I trusted the man, but when Aidan comes home talking about his “mean daddy” and how he is scared/lonely/sad when at his father’s house my heart spends a lot of the time in my stomach and my stomach in my throat. After my ex-husband tossed me around like a throw pillow, I stood before a family court judge on crutches and listened to her say “who do you think you are?” when I sought a temporary restraining order. I was a victim of domestic violence who didn’t want my 14-months-old son to be left alone with a sociopath. I have repeatedly pleaded with a different judge (both females, by the way) to not give this man more time with our son and question why she continues doing it. What have I done, other than be a dedicated and engaged mother, that would warrant taking my son away from me? And what has he done to earn any time with that little boy? It is very easy to lose faith in the family court system. I am not good at listening to my intuition. My intuition is usually right on point, but more often than not I don’t pay it much mind. Society has taught us, especially women, to not pay attention to our guts. As Westerners, we prefer logic and reason, conclusions that are supported not by emotions but by facts and statistics. The idea of a “woman’s intuition” has become laughable and most women I know would be ashamed to even voice this as a reason for making a decision. Intuition is this contemptable, unreasonable guide of emotions. Brené Brown defines intuition as “not a single way of knowing – it’s our ability to hold space for uncertainty and our willingness to trust the many ways we’ve developed knowledge and insight, including instinct, experience, faith, and reason. “ To me, intuition is something much more visceral. When I think of intuition I think of the moment I decided to turn the corner onto a busy avenue when walking a dark street in Manhattan. I think of the times I stayed home because “something” told me not to be on the highway then. I am a huge fan of Gavin DeBecker’s work. His book, “The Gift of Fear,” blew me away. I, unfortunately, read it long after I had been raped and while just beginning the divorce process with my ex-husband. In this book, Mr. DeBecker discusses how our natural instinct tries to protect us but we override those messages all of the time. Pick it up in the bookstore next time and just read the first ten pages. “As we stand on the tracks, we can avoid the oncoming train if we are willing to see it and willing to predict that it won’t stop.” Gavin DeBecker’s powerful metaphor is something that I trust any mother with an abusive partner can understand. I’ve been standing on the tracks for five years now. I managed to jump off to save my own life and got away with just some bumps and bruises. But every time I watch my little boy leave with the man I know to be violent, hot headed, and completely devoid of empathy I step back on that track and watch the train coming. When I filed the motion last month I also asked for temporary sole legal custody of my son, pending a full psychiatric evaluation. This is the first time I’ve tried. I know that it could either derail the train as it speeds towards us or fuel the fire urging it faster towards me while I hold my son in my arms. Call it mother’s intuition, call it a reasonable assessment of historical behaviors and statistics, but I know that unless I jump and take my boy with me, the train will hit us. When you first thought of faith did you think of church? God? I go to church almost every Sunday. My office is even in a church and I work for a religious organization. But I am not a “person of faith.” I am a Unitarian Universalist Atheist/Humanist. There was a time when I was a militant atheist. I suppose motherhood has softened me some. And I suppose that my desperate need for connection brought me to my spiritual home after I left my ex. Being so completely unaccepted for some time brought me out on the other side with a greater respect for other people’s journeys. I always loved the quote from Miracle on 34th Street, “Faith is believing in things when common sense tells you not to,” but I don’t think that faith and common sense have to be at odds with each other. I don’t have a faith in some supreme being. I don’t even know if I still believe that “everything happens for a reason” because I am starting to find it implies too heavily that I don’t have control over my future. What I do have faith in, though, is that if I put good into the world it will return. I pray. I’m not good at it, but it is a practice. I am still trying to figure out how you pray without praying TO something. But I find that attempting prayer builds my faith in others and the world we live in by helping to open me up to all of the experiences. I have no choice but to make that leap of faith off the tracks, because if I don’t and the train comes I will never forgive myself for allowing Aidan to be hurt when I didn’t do everything in my power to stop it. So now, despite a history of being let down by the courts, I have to find my faith that this judge really does care about what happens to my son. I have to have faith that I am enough, and that the papers I filed on my own, without the help of an attorney, are enough without citing precedent and extensive legal jargon. I must have faith that being the best mom I can be and loving that little boy with everything in me will be enough to make it right. I was surprised that in their cross motion, opposing counsel only requested an adjustment to child support and two more monthly overnights. I am facing a new opponent this time. Maybe this one has some sense and he will understand that his client is out of his mind. I am confident that the judge will, at worst, leave our schedule as it is. But I will trust in my gut when I go before the judge next Friday, speak what needs to be said and not betray my little boy because of my own fear of the train. I have faith that if I do that, my boy will be at least marginally safer and spend more time at home and less time chained to the track. **As I write this Aidan is asleep in his bed. I just kissed his forehead. His father had planned a vacation that would have begun Tuesday and then asked for an adjournment of our hearing. Based on the papers the judge ruled on my vacation points and wrote a letter prohibiting the Defendant from taking our son out of the state during the school year. Then she granted his adjournment.